Something odd has happened to some of my schedules, and I'm at a loss as to what caused it. 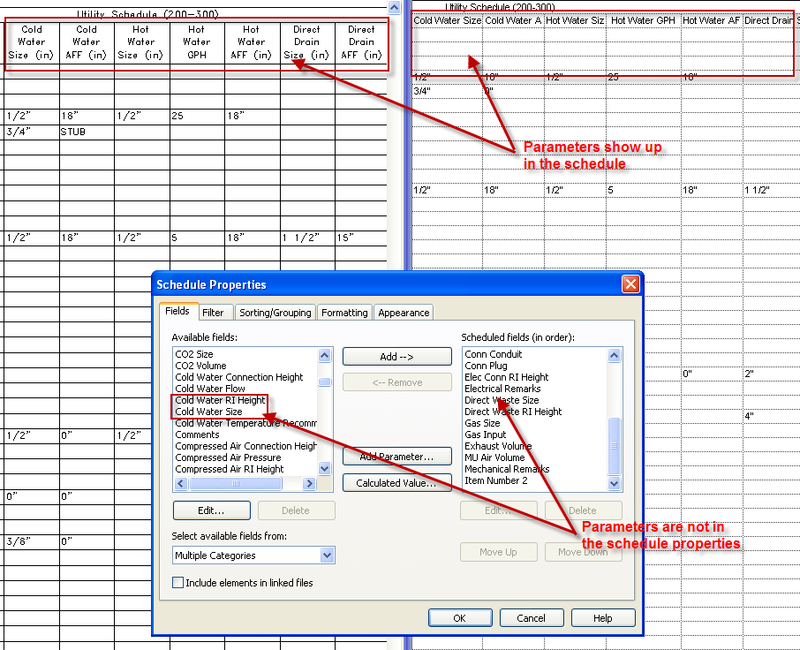 I have some utility schedules with a couple dozen or so MEP parameters. The plumbing parameters are unresponsive (new families don't show up, existing families are uneditable in the schedule), but they show up fine in the family type/instance properties. After poking around a little I ended up in the schedule properties, and all the plumbing parameters are missing from the schedule! They show up in the schedule view, and on the sheet, but they aren't in the properties. When I add them to the schedule everything works as it should. Has anyone seen this happen or know what caused it? More importantly, how do I fix it without recreating the schedules? That's weird. I assume you don't have duplicate parameters of the same name entered in the list further up that don't show in your screenshot, or someone has just renamed other parameters in the schedule so they don't actually match up? We would need to know more about your project. Remember, you can have schedule created parameters, project level parameters and then family parameters. All of those could be named the same but they are not. On top of that, not all shared parameters are the same. The name doesn't mean a thing, they have to be the sam shared parameter. All system level parameters are the same but if you create your own shared parameters with the same name - they are not the same as the system parameters. Mr Spot - The parameters have not been duplicated or renamed. They simply are not in the list any more, yet somehow they still show up on the sheet. WWHub - The affected parameters are all shared parameters, and they were added to the project and family from the same SP file. The schedules were just fine for a while, but something has happened recently that has caused them to go haywire. I have been working rather frantically toward a deadline so I've done a lot of work that i can't remember exactly, but I don't recall touching the schedules, I had no need to. After trying to fix this today, I have some more details/weirdness. I removed the broken schedules from the project, and used 'Insert from file|Insert views from file' to add a schedule from another project that I know is working. The new schedule came in just fine, with all the parameters the way they should be. The problem is, now none of the plumbing parameters show in the schedule (the parameters missing from the broken schedules). I tried reloading some families, but no dice. I opened a family from the library, edited a parameter so it would appear different from the one in the project, overwrote the family only (didn't overwrite parameters), and it showed up correctly in the schedule. I figured it would probably be faster to open the families from the project, so I found one and clicked 'Edit Family'. The family had none of the plumbing parameters, and an in place family from the project was inserted in the family. I tried a few more families with the same result. I deleted the in place family (which had the missing parameters), saved, opened and audited the project, and all the schedules now are missing the plumbing parameters. When I open a family from the project it no longer has the in-place family, but it doesn't have the plumbing parameters either. Opening the family from the library, changing a parameter value and reloading still works. strange problem with sloped walls meeting at diagonals: any suggestions?